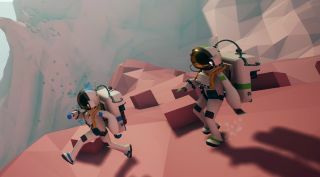 Astroneer, as it's described on its website, is an interstellar recreation of the Klondike Gold Rush. Humanity has, for reasons unknown, very suddenly developed technology that enables fast, cheap travel to the stars, and now the giant conglomerate Exo Dynamics is offering flights to anyone daring enough to explore and exploit distant worlds as an Astroneer. The site is actually quite thin on detail, but it does carry a number of lovely screens, and an intriguing reveal trailer as well. There's a faint Lifeless Planet vibe to it at first, but the action starts to take a different, and seemingly deeper, direction around the 30 second mark. There's some terraforming, and some base-building, and then what appears to be a spot of dying cold and alone, and then a storm whips up and everything goes to hell. And then a friend shows up! And there's a spaceship, and a dune buggy, and it starts to feel again like everything's going to be alright. Speaking of a lonely death far from home, the Astroneer site has a certain portentous tone to it, too. "As an Astroneer, you must find a way to dig out a life on one of a multitude of harsh new worlds. Blast through the terrain to uncover precious artifacts and materials you can use to fuel your quest to become a wealthy baron in the stars. Along the way, discover oddities, raise questions, and uncover mysteries," it says. "Perhaps not all is as it seems." The Astroneer blog offers a bit more detail about what's going on. Planets will range from small asteroids to huge worlds with atmospheres and landscapes, each one procedurally generated and unique. You'll have to "excavate and deform the land, uncover precious resources, jury-rig equipment to suit your taste and needs, create industrial scale extraction and manufacturing facilities, and locate rare items and artifacts," either alone or as part of a small team. In either case, you'll be "insufficiently trained and equipped by unscrupulous outfitters," but get rich or die trying, right? Probably more of the latter, if we're being honest with ourselves, but best not to dwell on that. Astroneer is being developed in Unreal Engine 4, and is expected to go into Early Access release in the first quarter of 2016. For now, you can subscribe to the mailing list at Astroneer.space.